I’ve been waiting to read I Kill the Mockingbird for a year. I spotted a review of it in a copy of Publisher’s Weekly and was instantly intrigued, but when I tried to order it for my store it was unavailable. I decided to keep it in the back of my mind for when it made it to paperback and hope that we could order it then. I didn’t even know about Go Set a Watchman at the time, so it is just serendipity that I am able to pair this book with Harper Lee’s bestselling works. Synopsis: Three best friends are beginning the summer before high school and have been assigned a summer reading list. 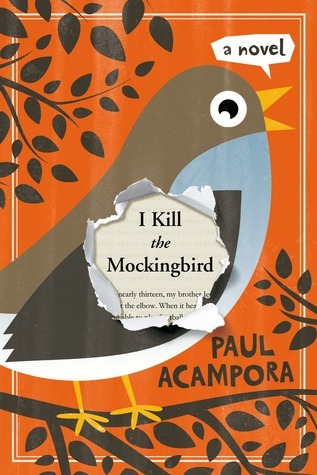 Lucy is thrilled to find out that To Kill a Mockingbird is on the list because it was the favourite book of her former English teacher and is her own personal favourite book. None of the other kids in class seem to want to read it (or any of the other books on the list for that matter) so the friends decide to make To Kill a Mockingbird a hot commodity in town by hiding all the copies they can find in stores and libraries. This book has a lot of pop culture references that are bound to date it eventually, but it was cute, fun, and a very easy read. It is less than 200 pages which makes it really quick to get through, and the content runs more towards middle-grade than YA even though the characters are teens.There’s a little bit of a romance but it’s very innocent, and the most serious discussions surrounding Lucy’s mom’s battle with cancer are entirely age appropriate. As someone who has never read To Kill a Mockingbird (sorry, I was assigned One Flew Over the Cuckoo’s Nest in high school! ), I was hoping this book would provide me with the incentive to do so. Unfortunately, I still find myself unable to summon the desire to read either of Lee’s books. A lot of people are reading it for the first time, or rereading it because of Watchman, so I’m hoping that all their rave reviews will get me excited. I am, on the other hand, sorely tempted to hide all the copies of Mockingbird around town just to see how people would react. It would be incredibly easy, as I have worked at both of the major bookstores in town and they would never suspect a fellow bookseller! That’s probably not the message I was supposed to take away from this book…. Have you read To Kill a Mockingbird? Was it assigned in school? Did you like it then? Have you reread it as an adult, and if so, do you like it more or less now? We were assigned To Kill A Mockingbird as one of our books for GCSE and it was okay, not a personal favourite by any means but much better than the other GCSE book they assigned us, Lord of The Flies. I wouldn’t recommend it personally but you never know, you might like it more than I did. Haha… yeah, I’ve reread a number of books that I was assigned and hated, only to find out that they are actually good books when read as an adult. It’s actually my greatest issue with the school system. Instead of teaching kids to love literature we force them to read books they don’t fully understand, make them write papers they hate writing, and then wonder why so many adults haven’t read a book since they graduated. I originally read this book because I was forced to in High School, but it became one of my favorites. I haven’t read it in over a decade, but your post really made me itching to read it again. Thank you! Glad to be of service! I think I need to start carrying it around with me so that it becomes my next read for the summer. I just realized I don’t own this book. My personal library isn’t complete without it!